Youth Glow Cleanser regulates the oil glands that produce the sebum (oil), which moves through the lining of each pore and then onto your face. Youth Glow Cleanser creates an unbreachable barrier, blocking all bacteria that are encountered throughout the day from touching your face. Youthful Glow Cleanser can both remove excess dead skin cells from the surface of the face and exfoliate inside the pore, to reduce its size. Weightless molecules, formed from organic citrus juice, combined with natural antibacterial ingredients allow the cleanser to be pulled into the pores, as the oil and dirt are dissolved, allowing for a deeper and more effective cleanse. Daily use improves cell production, to help your pores function more naturally. This is the best facial cleanser you will ever buy. PUNCH Skin Care's Cleanser is amazing! I absolutely love that it's organic and actually works well to cleanse my skin. 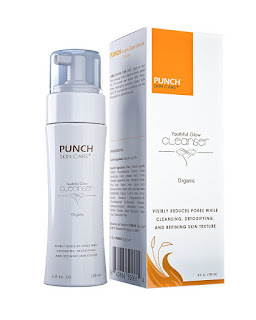 PUNCH Skin Care's Cleanser removed every trace of dirt and makeup from my face and I noticed less breakouts and even my extremely dry skin began to look balanced and healthy. My skin glows after I use this cleanser and never feels tight and overly dried out. I highly recommend this cleanser! DNA Repair: Corrects the mutations caused by UV exposure that lead to skin cancer and skin aging. Pro-Collagen/Dermis: Stimulates collagen production. Therapeutically protects the skin. UV Damage Reversal/Anti-Pigment: Lightens discoloration gently through healthy amino acids. Cellular Repair: Cleans up and repairs damage to the cell due to toxins and UV exposure. 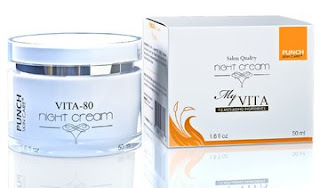 PUNCH Skin Care's Vita Night Cream works wonders! Each night I used this product, I'd wake up to healthy glowing skin. I also noticed that my sunspot on my jaw has begun to lighten and is barely noticable. My fine lines have almost vanished and my skin looks extremely healthy and feels extremely soft. I love that PUNCH Skin Care's Vita Night Cream is organic and all natural and actually works. This is a wonderful product! 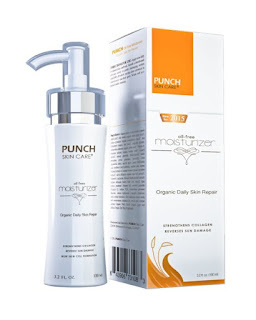 PUNCH Skin Care's Daily Skin Repair Oil-Free Facial Moisturizer is awesome! I love that PUNCH Skin Care's Daily Skin Repair Oil-Free Facial Moisturizer is light and absorbs into my skin quickly. It doesn't feel greasy and I've noticed less breakouts. My skin glows after I apply this moisturizer and feels hydrated and healthy. This is a wonderful moisturizer! Punch Skin Care Brightening Eye Cream is fantastic! The skin around my eyes feels much firmer and looks years younger. My fine lines around my eyes have lightened and my eyes looks less puffy. I also suffer from chronic dark circles under my eyes and have seen my dark circles lighten and can even get skip using a concealer thanks to this product. This is a wonderful eye cream! The Arbutin help to prevent photo-aging, reduce sunspots and discoloration due to sun exposure Source: Microdermabrasion Facial Scrub, Exfoliating Scrub, Face Scrub, Microdermabrasion Scrub, Chemical Peel, Facial Exfoliator, Best Exfoliator. The Vitamin C and Red Wine Polyphenols Reduce or eliminate enlarged pores., giving skin a more toned appearance Source: Microdermabrasion Facial Scrub, Exfoliating Scrub, Face Scrub, Microdermabrasion Scrub, Chemical Peel, Facial Exfoliator, Best Exfoliator. Remove 10 years of poor skin health in just three treatments Source: Microdermabrasion Facial Scrub, Exfoliating Scrub, Face Scrub, Microdermabrasion Scrub, Chemical Peel, Facial Exfoliator, Best Exfoliator. Ideal for acne, hyperpigmentation and premature aging, unclogs and reduce appearance of poresSource: Microdermabrasion Facial Scrub, Exfoliating Scrub, Face Scrub, Microdermabrasion Scrub, Chemical Peel, Facial Exfoliator, Best Exfoliator. I love Punch Skin Care's Exfoliator and Facial Scrub Treatment! I suffer from extremely dry facial skin and often have dry patches. While most people have oily t zones, mine is extremely dry. Punch Skin Care's Exfoliator and Facial Scrub Treatment sloughs off all of my dry facial skin revealing healthy fresh skin. It doesn't irritate my skin and has helped to keep dry patches from reappearing. I've noticed my pores look smaller and my skin absolutely glows after I use this product! I absolutely love this product and highly recommend it. Thanks for the write up! I just ordered the Daily Skin Repair Facial Moisturizer, thanks for the review!